Cebek USB.TL-40 is a USB operated 8-channel 433.92MHz RF remote control transmitter with 100 metre range. 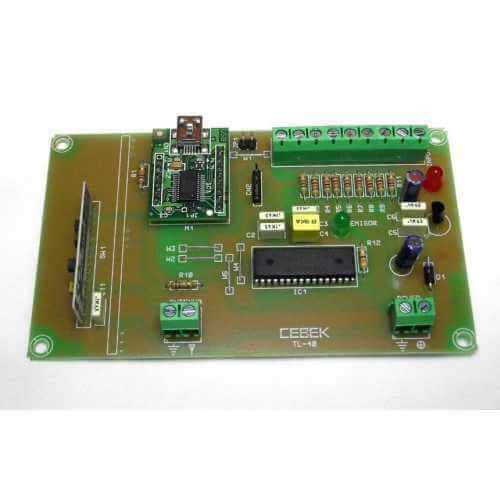 Works with all Cebek Group 3 receivers including TL-310, TL-311, TL-601, TL-602, TL-612, TL-613. It connects to a USB port on your computer, allowing you to remotely control each channel and Reset. Free Windows software interface is available for download below. PCB mounted LEDs indicates when the board is powered and when a valid command is received. It has screw terminals blocks and reverse polarity protection.